Detox products: 5 Panel Urine Drug Test Kit with Adulteration Test Integrated in E-Z Split Cup. Pass drug tests, passing all drug test. 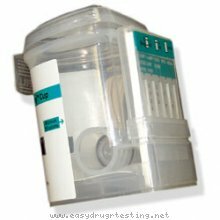 The new 5 Panel Urine Drug Test Kit with Adulteration Test Integrated in E-Z Split Cup don't need any additional instruments or equipment, it is complete drug testing kit for detection and recognition 5 most common illegal drugs, also known as NIDA-5: Cocaine, Amphetamine, Marijuana, Opiates, and Phencyclidine. All inclusive design of this drug test kit exclude handle of the urine sample and ensure the veracity of urine sample and drug screening results. Activation of integrated drug test kit could be turned on by collectors only, as result, donor can not manipulate with specimen. Peel able label put out of sight drug test result from those who do not need to view results. Flat surface makes documenting result easy to read and copying. Integrated drug test cup also includes adulteration test to check the integrity of a urine specimen and eliminate any attempts to pass a drug test procedure with different additives, pills or drinks. Our drug test kit cup also provides testing for Oxidants, Special Gravity, and pH. The easy Split Key Cup is an affordable drug testing solution that provides a quality screening method with (99%) accurate results.